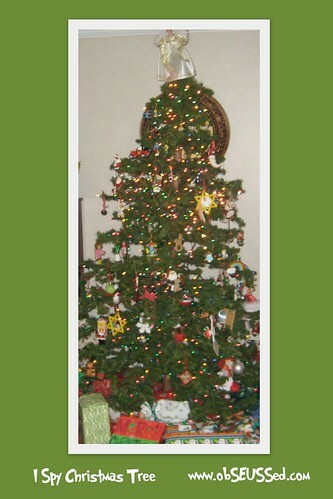 Sit with your child and look at your tree together. Describe ornaments to see if they can find it. "I spy a penguin, or I spy a santa on a sleigh." Take turns and try to be very descriptive with colors, shapes or objects they are not familiar with. 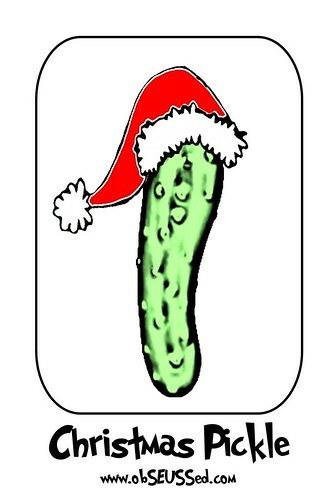 Have you heard of the Christmas Pickle? It is a old German tradition, read more about it here. We have a Christmas tradition that whoever finds the pickle ornament first on Christmas Eve, gets to open the first present. 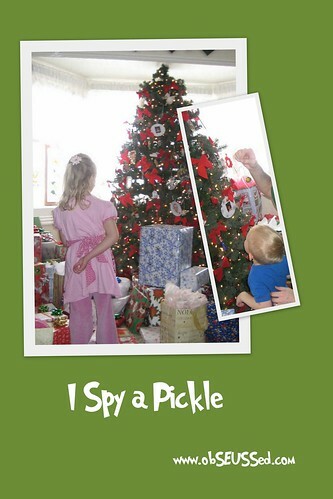 One year my mom couldn't find the ornament so she hung a real pickle for my kids to find (see picture below). I do not recommend doing that. You can buy an ornament like the one below or select another special ornament of yours to be the hidden one. Or print the free one I designed and cut it out to hide it. I Spy Books are a favorite around our house. The Christmas I Spy books keep our kids entertained for hours. They especially like searching for the Seymour wooden boy in the 'Can You See What I See' book by Walter Wick. They also love the Look-A-Like series. We love Walter Wick books!